My great-aunt, Sister Mary Sulpice Offutt, VHM introduced me to the great Saint Francis de Sales when I was a young man. Reading of his life in the early part of the 17th Century, I found that I had a great affinity with him. We both love to teach the faith. We both believe in the importance of teaching that Holiness is for everyone; not just priests and religious. St. Francis was born in 1567. Foregoing a career in law, Francis was ordained a priest in 1593 and in 1602 was appointed Bishop of Geneva. At the time, Geneva was a hotbed of Calvinism. At times, Francis could not even safely enter his own diocese. But eventually, through the use of pamphlets explaining the faith, he converted over 70,000 Protestants back into the Church of Rome. He wrote several books, the best known of which is the Introduction to the Devout Life. Francis' style of writing is to present his topic in short segments that can hold the attention of the reader in the most distracting circumstances. St. Francis de Sales was watching over me throughout my training to be a deacon--literally. When we met monthly for Mass in the Chapel of the Archdiocese of Washington Pastoral Center, there was a great statue of St. Francis de Sales looking out over the nave. I am told the building was once a Salesian facility. And Francis' name was added to the Litany of the Saints for my ordination at the National Shrine of the Immaculate Conception in Washington, DC. 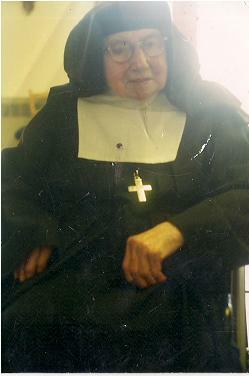 My great-aunt died in the Monastery Mont Deux Coeurs in Tyringham, Massachusetts at the age of 105. For my part, due primarily to Auntie's influence and love, my spirituality is nothing if it is not Salesian. With my ordination to the diaconate, the model of Saint Francis has served to remind me that I should always take care to teach and preach in a gentle manner explaining the faith in way that relates it to the problems of everyday life. He has motivated me to remember to impress on those I serve that holiness is for them! Indeed, all of my homilies end with St. Francis de Sales' motto and admonition: Live Jesus!